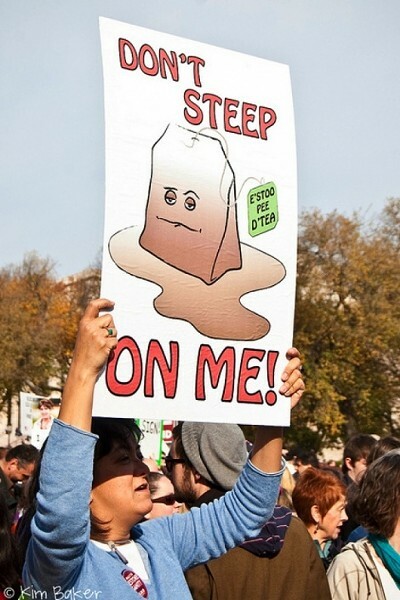 The Oct. 30 Rally to Restore Sanity/March to Keep Fear Alive was conceived by TV comedy writers and promoted entirely by media personalities.--- However, it ended up being a genuine indictment of Tea Party politics. Was it a new kind of media-inspired political action? Or merely a reflection of the kind of Fox News rabble-rousing that got the teabaggers all worked up in the first place? "Christine O'Donnell turned me into a newt!" A reference to Monty Python and the Holy Grail -- as well as O'Donnell's silly "I'm not a witch" campaign ads. A parody of the Tea Party's clueless misappropriation of the Revolutionary War-era Gadsen Flag as an anti-Federalist symbol, even though it originally promoted Federalism and was derived from Ben Franklin's famous pro-Union "Join or Die" cartoon. "I like my beer cold, my TV loud, and my homosexuals flaming"
Nothing tricky here -- just a great line from a Simpsons episode. This one's interesting. Since it's derived from a 1980s T-shirt slogan promoting the band Frankie Goes to Hollywood, technically it should be "Jesus say relax." However, such grammatical errors are so common at Tea Party rallies, this one might not be recognized as intentional, so the verb conjugation had to be corrected. Subtle or just hypervigilant? You decide. We know the code on this placard is in C# or C++ not Java since the variable "reason" is declared as type bool instead of boolean. If the property "rationalDiscourse" is true, oddly, the catch block calls method "fixCountrysProblems()" again -- without actually dealing with the PartisanException. Otherwise, the catch block passes the exception instance on to the "bickerAndFight()" method. "If they were in power, things would be a whole lot worse than they are." It says what it means and it means what it says. No irony or subtext. Reported in the D-News coverage of Salt Lake City's sister rally. Sam Ponder's slogan is the best of the bunch, period.